Baccy how goes the growth of its hair? how goes the growth of its hair baccy? it of course continues growing? Well it’s too early to say. Lots of vellus and some new semi-terminal but nothing really useful yet. I’ll report as and when but it’s only been a little over one month. According to Mike’s timeline, it’s probably going to be a total of 3 months before I start getting excited, if I get anything to BE excited over that is. » BE excited over that is. It looks like u have more black dots… I would have to compare it to ur old pictures to compare. so what r we doing wrong? » old pictures to compare. LOL! I think you misunderstand Mike. That was a BEFORE pic from an old attempt from last Autumn that Baldlatino dug up. But my current state is not much different as I shave it regularly. Until I get a decent coverage of hair anyway, if ever. But I hope those little black buggers multiply! I’ve been balding severly since 17. My hair also exhibited that thinner towards the end/root symptom mentioned. AGA Literature says that AGA hair get thinner at then end of the hair cycle i.e. they shouldn’t thin during the same anagen phase. Rassman’s answer to the guy basically says that it’s Not AGA. Do you remember seeing hair that exhibited thinner diameter towards the root But thicker towards the other end? I’ve seen several posts on the other big forum where young guys have mentioned this style of hair loss, so I’m really looking into this these days. Maybe the reason we lost hair quickly was this other disease causing the hair to just shutoff during the anagen phase. » » old pictures to compare. » of hair anyway, if ever. But I hope those little black buggers multiply! To avoid confusion, this pic was to serve as a BEFORE pic for future experiments but was actually an AFTER pic for my successful experiment. The little hair I gained (nothing cosmetic) grew quickly after the experiment so I didn’t really notice. The speed of it’s arrival led me to conclude that it was rejuvenated hair. However, rejuvenated it may be, but hair hadn’t grown there for 10 years or so. » hair hadn’t grown there for 10 years or so. Actually, I was talking about your hair loss when it originally started in your teens. Were the falling hair noticably thinner towards the root? in normal AGA they shouldn’t be. this speaking of this image…these hair continue growing? » » » Not AGA. » » » anagen phase. » » hair hadn’t grown there for 10 years or so. » normal AGA they shouldn’t be. Don’t think I noticed. Remember, we didn’t know a lot of the stuff we know now. All I did was try to count the hairs and hoped that the daily shed didn’t exceed 100. Then I could kid myself that I wasn’t going bald. » this speaking of this image…these hair continue growing? If I let them grow, they do so VERY slowly and because my head looks better totally shaved than with a cosmetically insignificant amount of hair, I keep it shaved. Some of them are terminal, others are semi-terminal and there are a lot of vellus which the camera doesn’t pick up and cannot be seen from a distance. 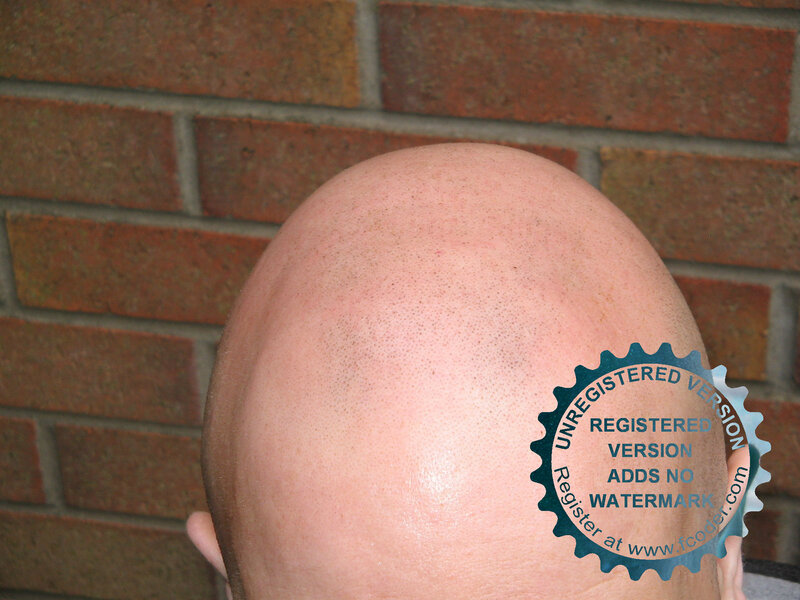 Hairloss is regarded as cosmetic and cosmetic industries are run by money. For the HT, wig-makers and the drug companies, there is no money in an all out ‘cure’. They look for treatments, not cures. 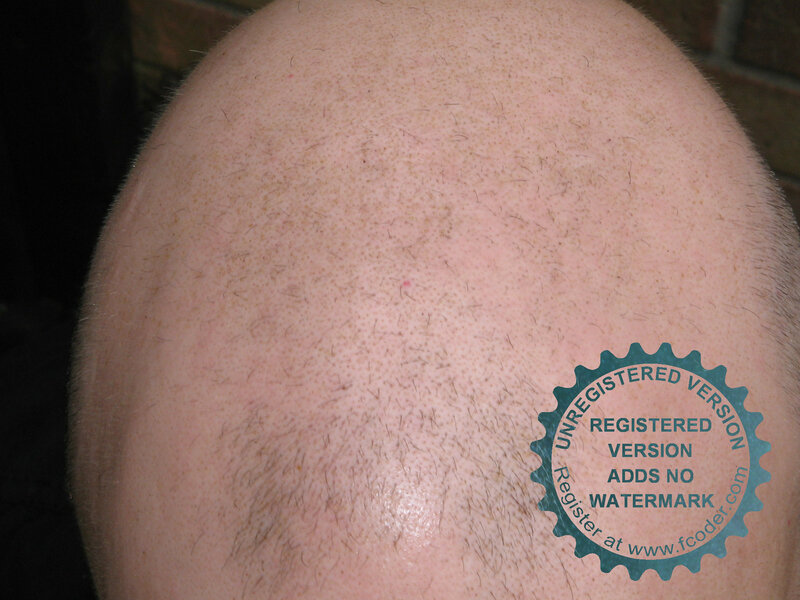 Like minox, a treatment giving minimal results but it’s very popular and has to be used for an indefinite period of time. If I was a researcher who thought I had the answer, I would release just enough info and facts to get the interested parties (the HT, wig-makers and drug companies) well…‘interested’. Then I would sit back and wait for the ‘partnership’ offers to roll in. In this ‘partnership’, it would be discovered that despite earlier enthusiasm about the intended procedure, there were in fact HUGE problems with the process and further studies and research would be necessary. This would probably take five to ten years. There was a product to totally and completely reverse gray hair. It was by Loreal and was called Promel and it was nearing release by 2007. Suddenly, the damned thing disappeared off the face of the earth. Even Loreal claimed that there was no such product. But surely there is no smoke without fire? The problem with ‘Promel’ is that it is a one-shot cure for gray hair and would eliminate the need for the user to use hair-dyes and other ‘anti-gray’ products. In other words, Promel would be a ‘cure’ whereas the desirable thing from a business standpoint is to have a ‘treatment’. Treatments can co-exist with one another. The market can sustain competition between rival treatments. But a cure would eliminate them ALL. Does anyone have a pic of the results? How about a link to any testing being done, like ads seeking trialists or something? I saw nothing surrounding that whole operation, other than a few statements that they’d made about some biochemical discoveries that might LEAD TO a way to reverse it. Sort of like the yearly press releases we get about “scientists have discovered that the ____ gene is linked to hair loss.” I wouldn’t read that, and make the jump to the idea that an MPB cure is ready to ship out to stores. » Except that nobody ever actually saw this product to reverse gray hair. » being done, like ads seeking trialists or something? » LEAD TO a way to reverse it. You might be right. It’s only my opinion. I don’t think that these medical professionals would lie to us. That’s like saying that the governments of the world lie to their people. The link I’ve pasted may be a hoax, I admit. The link contains a quote by Loreal that also may be a hoax. Basically, I don’t trust anybody. And if that makes me paranoid, then so be it. But something fishy is going on with this whole hairloss thing and I don’t think it’s related to flawed science. I don’t blame you for being paranoid. Hair loss has certainly been an infuriating issue for us. The frustration is that the goddamn thing SEEMS like it should be so easy. But it isn’t. But look at it this way - there’s no logical reason to sit on a better cure for scarring, either. In fact there’s every reason to WANT that out in the open, so it would encourage more cosmetic surgery work of all kinds. And yet if I’d spent the last 20 years disfigured by some hack doc’s strip-scarring, I might be very willing to entertain the idea that there’s a conspiracy against fixing it. It seems like this kind of heavy scarring could be easily cured if science “wanted to do it,” doesn’t it? And yet the US government is paying all kinds of money to war vets for the rest of their lives with terrible burn scarring & stuff because they can’t fix that little problem. Same with paralysis. It’s just one stupid little spot of nerve connections in the spine that they’re missing . . . how goddamn hard could it be to regrow that stupid little connection? Or even just artificially fake it somehow with a synthetic connection of some kind? Hell, can’t they TRANSPLANT from a dead organ donor or something? People’s lives & futures are completely ruined because of this tiny little problem all over the world, and science hasn’t fixed it yet. And just like scarring, there are hundreds of thousands of people out there (probably millions worldwide) that are being covered by insurance or various other military care type medical benefits (for life, not just temporarily) because science can’t solve this.